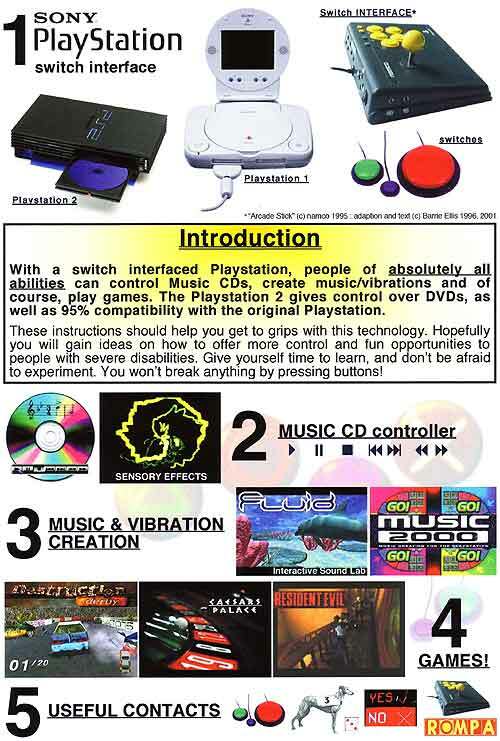 With a switch interfaced Playstation, people of absolutely all abilities can control Music CDs, create music/vibrations and of course, play games. The Playstation 2 gives control over DVDs, as well as 95% compatibility with the original Playstation. These instructions should help you get to grips with this technology. Hopefully you will gain ideas on how to offer more control and fun opportunities to people with severe disabilities. Give yourself time to learn, and don't be afraid to experiment. You won't break anything by pressing buttons! Please view this PDF until this page has been repaired. By using attachable adapters to your Playstation controller, you can use switches on many other games consoles and computers, such as the Atari 2600, PCs, Macs and Dreamcasts. Link: Playstation adapters. 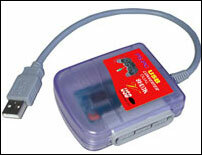 a) Playstation to PC USB Adapter - Allows you to connect any Playstation controller into a PC. b) Joy to Key - Keyboard and Mouse software emulator for joysticks. Please contact me if you have any problems. Download a PDF copy of the Playstation Switch Interface instructions here. Playstation is a registered trademark of Sony. The OneSwitch.org.uk switch interface is an adapted Namco Arcade Stick. First adapted in 1996.